Spider-Man is getting a lot of press lately. With the new casting of Tom Holland as old web head, his brief but welcome mention in Ant-Man, and the rumors of his first appearance in next year's Civil War, fans are rejoicing at his move into the Marvel Cinematic Universe. But let's not forget a couple earlier movies under the banner of the Amazing Spider-Man. 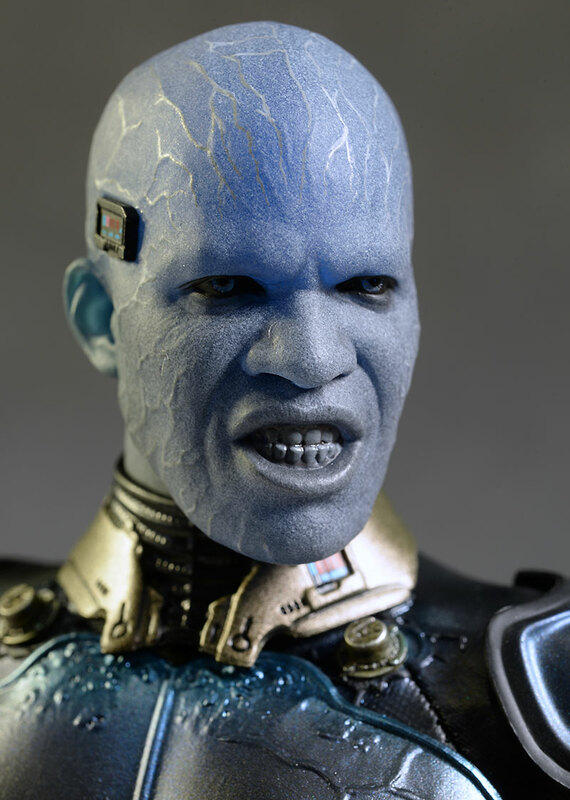 The second flick had a great villain in Electro, portrayed perfectly by Jamie Foxx. 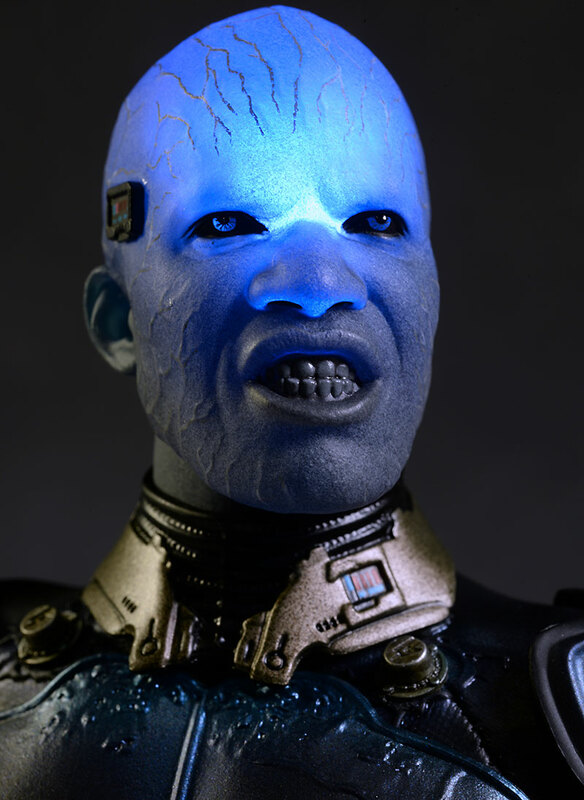 Sadly, it seems we'll never get the greatest Foxx Hot Toys figure - Django - but they have produced their version of his terrific Electro. 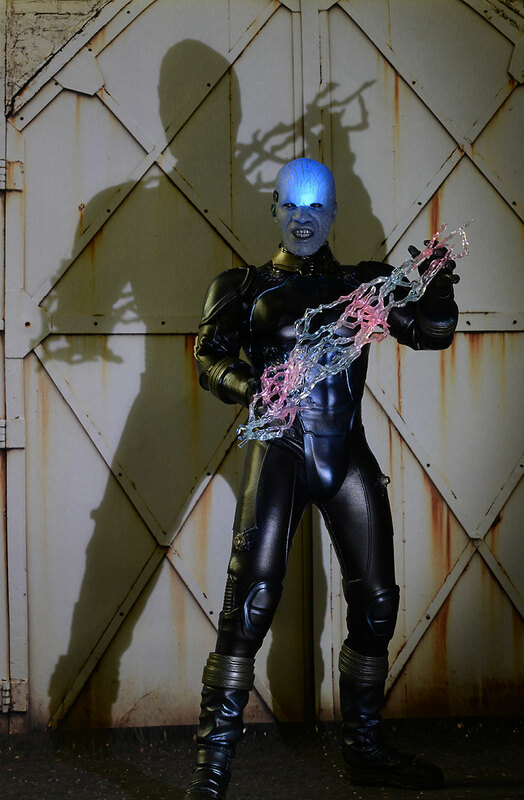 This guy is the perfect companion piece to their Amazing Spider-man 2 Spider-man. He's been shipping for awhile now, and will run you around $220 - $230, depending on the retailer. There's no exclusive or special version, so what you see here is what you'll be getting. The box is pretty standard stuff for Hot Toys, from the shoe box style, to the basic cardboard insert, to the double plastic trays that hold the figure and accessories. 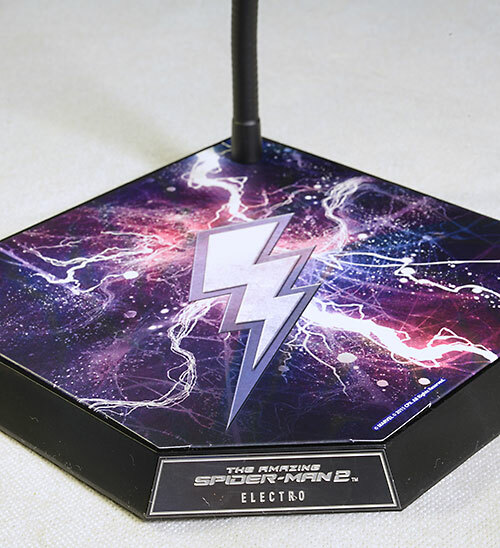 Everything is collector friendly, and it does match the overall style of the box they did for Spidey, but it lacks that certain pizzazz. It's also worth noting that while the majority of the plastic wrapping used to protect the figure in the box is loose enough to easily remove, you'll once again have to cut the wrap booties off. I hate pulling out a knife around my figures...nothing bad has happened so far, but it's only a matter of time. They did include instructions, and they cover the major areas here including the batteries and light up features. I'm normally not a fan of the extreme expression - it is such a fleeting look on a person's face that it works with relatively few poses, and it ends up silly. That's not the case here, however, and I'd say this is one of the better extreme, snarling, angry expressions I've seen. There are lots of good movie stills to compare, such as this one, this one, or this one. I judge sculpts like this on three criteria: realism, life-like, and accuracy. 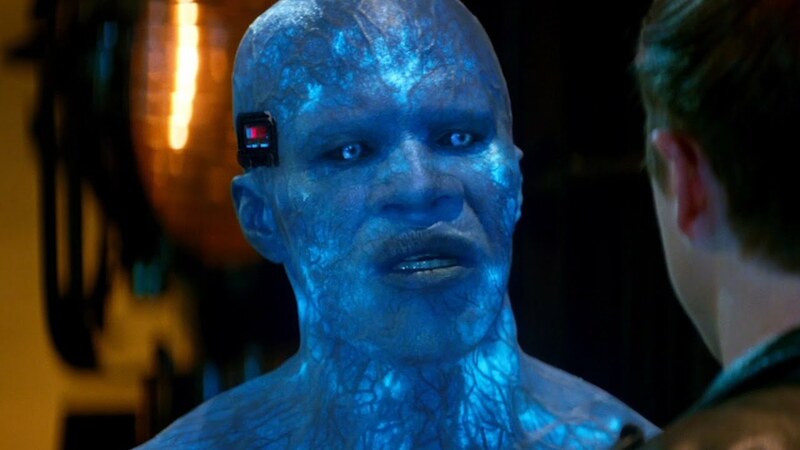 When it comes to realism, they nailed it of course, right down to sculpting even the thin 'veins' exposed by the electric current running through his body. I already said I love the life-like nature of the expression, capturing his constantly pissed off demeanor. 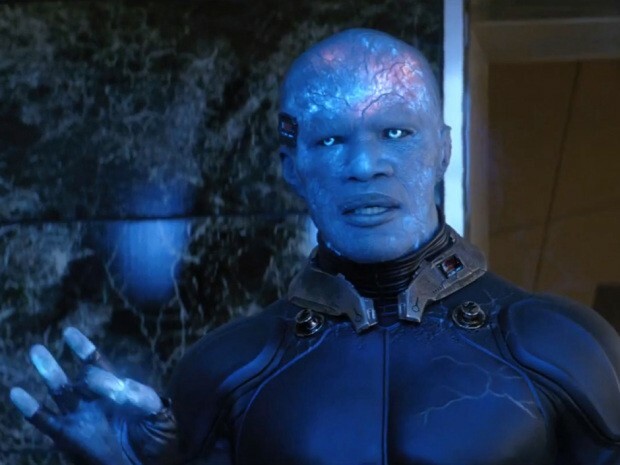 And this is clearly Foxx as the character, including the shape of the jaw line, nose, and head. There's even the messed up left ear! There are a couple nits though, which may be more or less of a problem for you. First, the chip on the right side of his head seems a tad small. It's not a lot, but enough that I noticed when doing some comparisons. The other is also minor, but can be pretty obvious thanks to the selected expression. The teeth, while quite realistic, aren't quite the same in terms of size and shape as Foxx's. Because he used this same expression a lot in the film, it's more noticeable than usual. Both of these issues are quite minor though, and most folks won't mind or even notice. And yes, if it isn't obvious enough, he's sixth scale, coming in at just under 12" tall. There's a little weirdness to the paint because of the light up feature, but in hand, it's not a problem. You'll notice in photos that the upper half of the head - from the eyes up - seems lighter than the lower half. It's all the more obvious when you turn on the bright light in his head. That's because the lower half of the head is solid, while the upper half is hollow and translucent. In moderate light, the entire head looks fine, but when you hit it with any sort of bright light or spot, you'll see the variation. It's not a major issue for the most part, but you might want to consider it when picking his place in your display in relation to your lights. The detail work is excellent, including the veins, gums and teeth. I particularly love the blue eyes, which glow even brighter when the light is turned on. 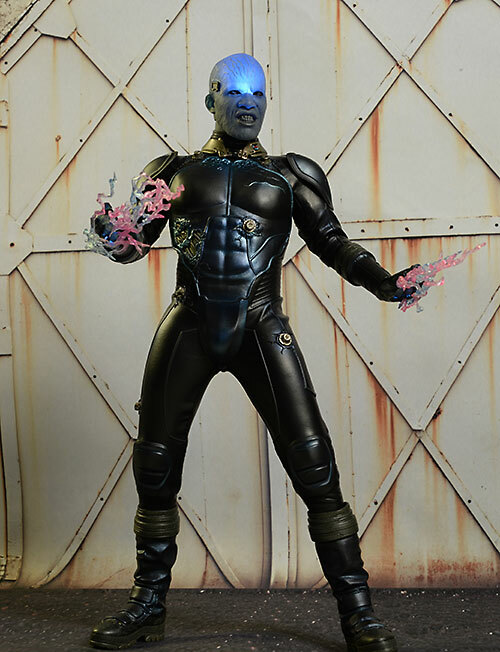 This is a costume where there actual paint operations as well, including the harder plastic armor pieces and the small connectors. They included battle damage in various spots - more on that in the Outfit section - and the paint work does a nice job of selling the effect. While the underlying body is another excellent TrueType, the suit makes any radical poses impossible, and even some of the basic versions difficult. The head is not attached to the neck - it's held in place with a strong magnet. That allows you easier access to the switch (and battery compartment), and the joint still maintains a full range of movement. The shoulders, hips, waist, thighs, knees and ankles are very restricted by the tight material. He can take natural poses as long as they aren't deep stances or crouches. I found this annoying, since I wanted to get the waist, hips and ankles to allow him to crouch down in a better fighting stance, but it wasn't to be. The hands/wrists work well though, and the hands swap easily. Perhaps the biggest disappointment for this figure is in the Accessories department. He's pretty short on extras, especially considering the price point. He has four sets of hands in total: a gloved, slightly relaxed pair with translucent fingers he comes wearing; a gloved, splayed set sculpted at an angle at the wrists (also with translucent fingers); a bare set of fists, and a bare set of splayed hands. They swap pretty easily, and scale is reasonable. He also has two sets of energy bolts, one short and one long. 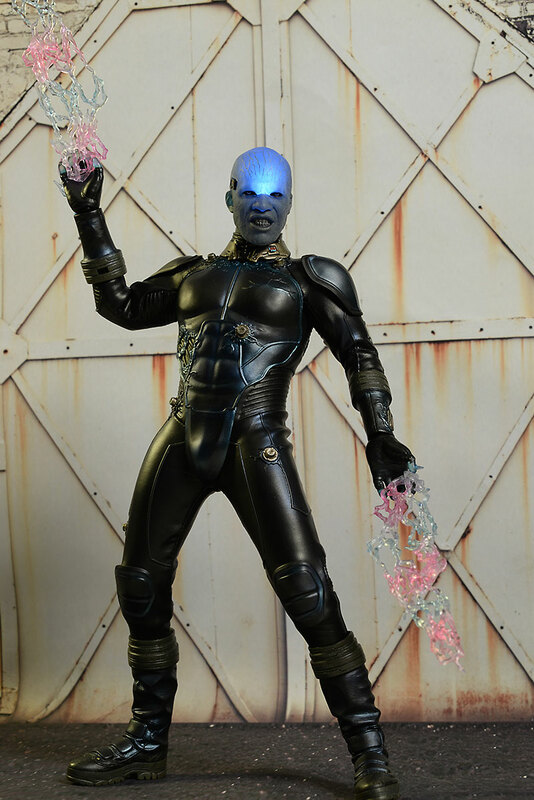 These sorta, kinda, wrap around his hands, but the effect isn't particularly good. I'm not a huge fan of these sort of plastic extensions, but these are a bit better than the webs we got with any of the Spider-Man figures. Finally, there's his display stand, the same sort we got with Spidey. The thick, bendable metal support rod allows for in air poses: flying, rising, jumping, landing, etc. It's easy to assemble and can easily support the weight of this particular figure. I also like the engraved name plate on the front, but the cheap cardboard logo insert on the top reminds me of something I'd get with a $30 Hasbro toy. When you're paying this much money - and not getting a lot of extras - you expect to see that money reflected in the quality of every piece. 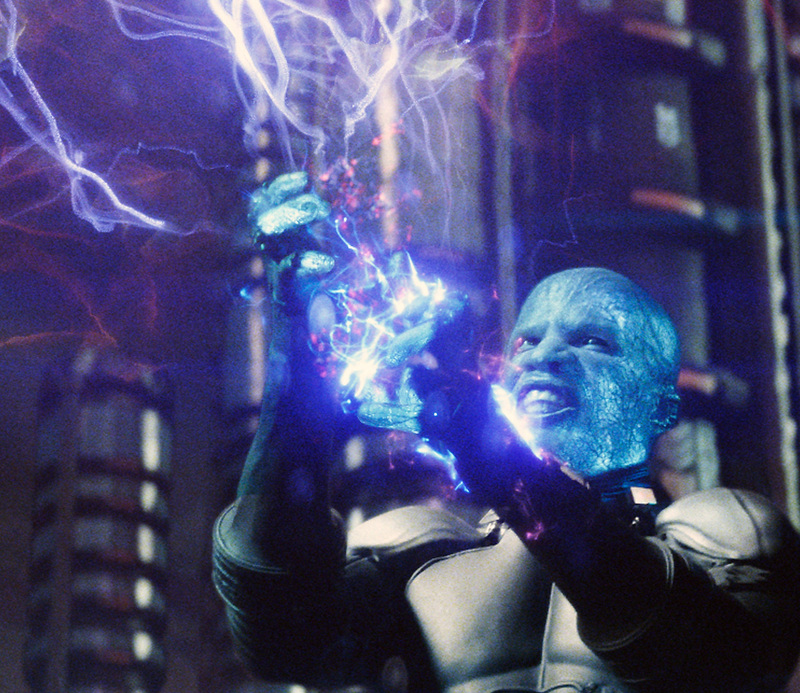 There's no way you can do Electro without a light feature - he was a bright beacon of evil almost the entire time. There are three lights on the figure: one in the head, and one in each hand. The battery compartments are a bit tricky to work with in all three spots. As I mentioned, the head is held in place with a magnet, and you simply remove it to expose the switch and the compartment deep in the skull. To get to the hand controls, you need to pop off the hand and remove the gauntlet. This will give you access to the battery compartment, but there's a small rectangle cut in the underside of the gauntlet that allows you to flip the switch without constantly removing the piece. The light in the head is very bright, but because the lower face is solid, it only illuminates the top half of the head. It's a minor nit, and was difficult to do differently since the electronics for the light have to be housed there. The hands suffer the same problem that light sabers or any finger extensions do - the light just isn't bright enough or directed enough to illuminate them cleanly. The thumbs and pinky on both hands work best, and whether the fingers in between light up or not depends on the position of the hand. I think they should look at a way to bring thin fiber optic lines from the fingers (and other extensions) down closer to the light, and see if that provides a better effect. It might be restrictive, but it's damn fine looking. 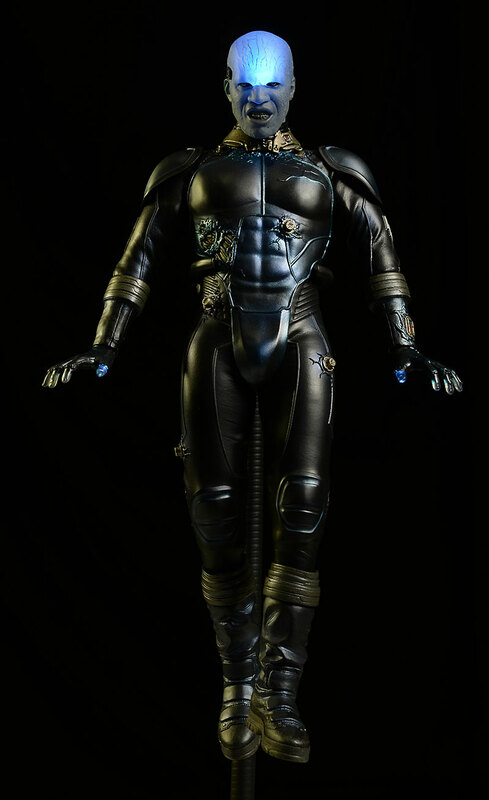 The costume includes a stretchy suit covered by harder plastic armor in key spots. So what are these sort of body suits made from? It's clearly not the sort of rubber material that we saw problems with on characters like the Comedian. It's more like a vinyl, but with a slightly greater elasticity. Whatever the case, it's clearly being used as a better (theoretically) alternative to the more rubber based material that tends to degrade over time. I wouldn't display him in direct sunlight, but I'm hopeful that with standard heat and humidity, this guy should last a lifetime. The sculpting and paint work on the harder plastic pieces looks fantastic. I particularly like the damage they added to the chest, perfect for posing this guy in battle with Spider-Man. 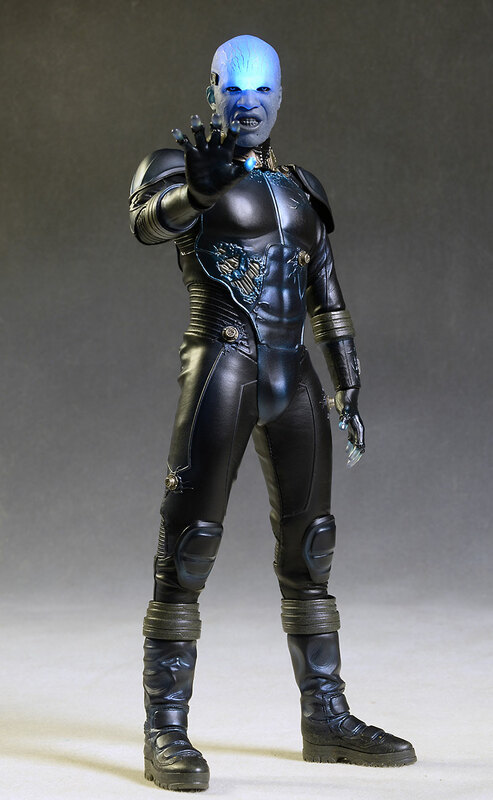 Because of the greater restrictions on the poses and stances you'll be able to use, this guy isn't quite as much fun as the average Hot Toys figure. It's not his (or their) fault, but just an outcome of the tight villain costume. You'll find a pose you like, but you won't be changing it up all that often. 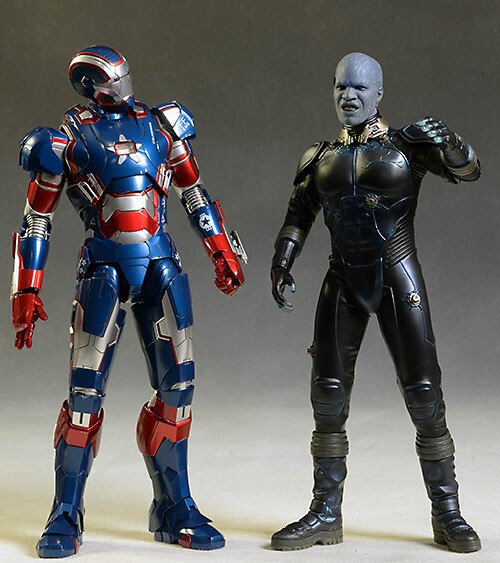 It appears that Hot Toys has settled on a $225 (or so) price tag for their usual releases. This guy will run you $230 standard retail, but there's some folks (see my Where to Buy section) that have it for under $220. The one thing he has going for him is the light up feature - and that's one of those things that is great to start, but gets used less and less over time. Some collectors never use it, fearing that if they leave the batteries in they could leak. You're also getting very little extra in the Accessories area, making it a tough sell at this price. 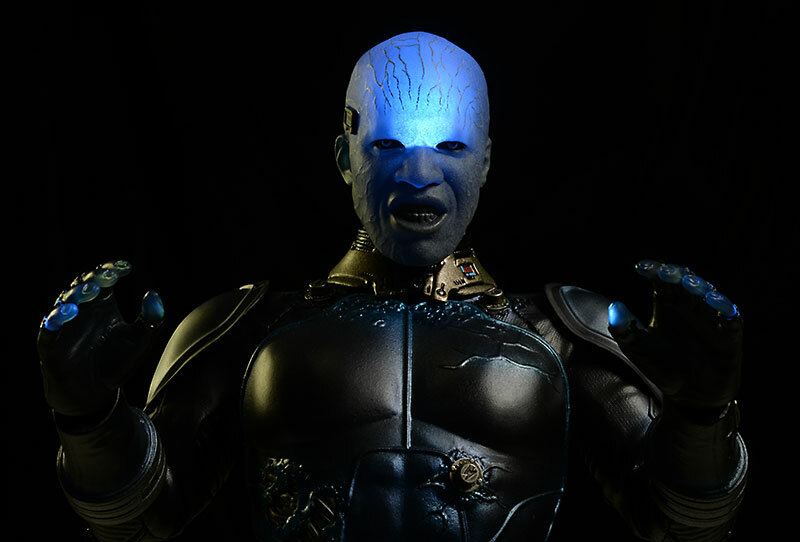 However, much of the cost is in the light up feature, and considering the B list nature of the character, I'm betting the production numbers are relatively low as well. Understanding all this, I'm only knocking off a half star from average here, and if you can snag him for $215 or less, I'd go with an extra half star. The thin energy blasts can break, so take a little care when putting them around the hands. Otherwise, you shouldn't see any issues. The sculpt and paint are the big winners here, but they are balanced out by very few accessories and a highly restrictive costume. I found myself frustrated with the posing potential, particularly with such a dynamic villain. However, we have gotten so few Spidey villains that one can only be so picky. You also have the Green Goblin from the Raimi series...and that's it. 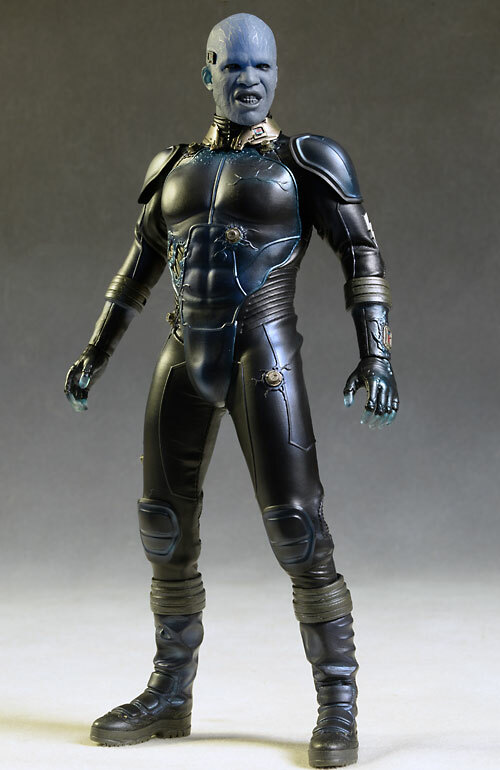 Hot Toys showed of a Rhino two SDCC's ago, but there's been no mention of him since (are you really surprised considering how much he would cost to produce?) and no other villains in the works. 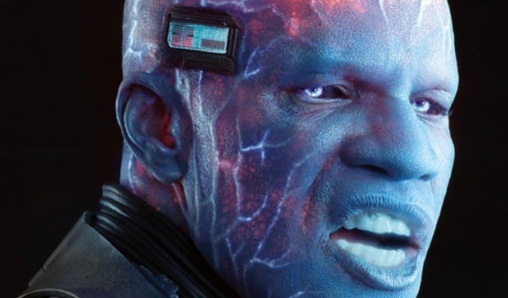 Now that he's officially part of the MCU, the web slinger will probably get some more love, but until that happens, Electro is your best choice to battle Spider-Man on your shelf. He's also a character that just might come down in price on the secondary market over the next few weeks, but may start to rise once all the figures are in the hands of fans, rather than dealers. - Sideshow has him in stock at $230. - has him at just $217. - comes in at $220. - has him in stock for $230. 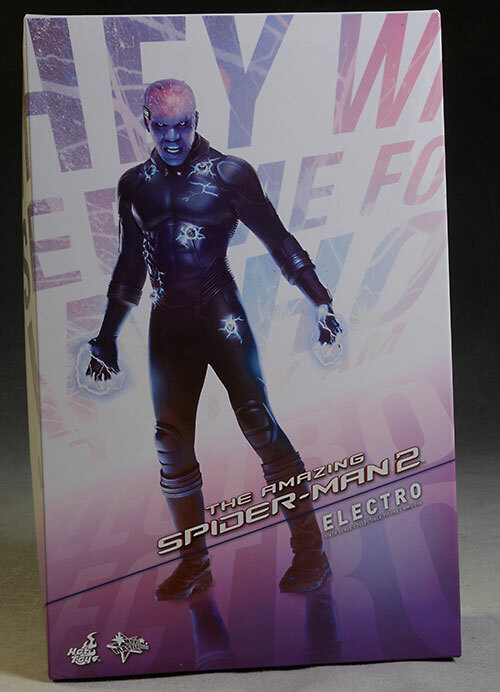 Hot Toys has done plenty of Marvel characters, but if you get Electro, you really need their Amazing Spider-Man 2 Spidey to go with him. You can also check out Hot Toys attempt at the Raimi Spider-Man with this release based on the third movie. 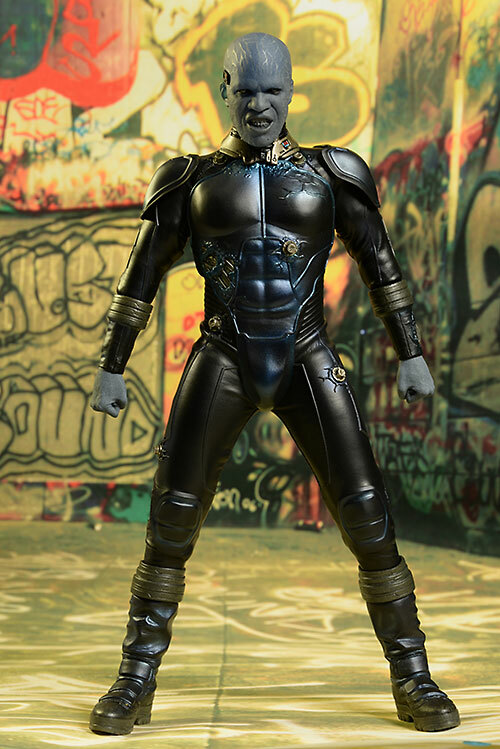 They've also done a nice Green Goblin, also from the third Raimi movie.